I feel excited when I got the news! I just think where to buy a house which can be convinent tommorow and the price is not as high as downtowns’. We need the house, but most of us can’ t afford. I am looking since a long time for this map. Thank you. Shanghai is so big, than even when you are on a metro line, you might have to walk 10 to 15 minute to have a metro station (for example when you are in Plaza 66). I am still waiting forward to use all these metro. But the extension is not on JianShuo’s version. Can anyway tell me when/if line 9 will extend on past MingShen road ?? Great map. Unfortunately (according to described construction plans on Urbanrail.net and its executing) I think these plans will turn into big delay – not 2012 but, for example, 2015; 2018; 2020. There will be a great change about Metro in Beijing 2008. Maglev vehicles use less electricity than conventional high-speed rail, primarily due to the lack of mechanical friction. It’s a common misconception that Maglev is power-hungry, as levitation is such a novel concept. Ben is absolutely right. Maglev trains also emit a lot less carbon relative to other transport technologies due to their energy efficiency, even when the electricity is generated from traditional sources such as coal. BTW, the reason they’re not being built much in the West is due to a general reluctance on the part of governments to take on large public infrastructure projects that have significant initial funding requirements. Due to the relatively short terms Western governments have between elections, they tend to optimise themselves for short-term gain rather than long-term benefit. Funny how that trade-off works. Increasing term limits for elected officials would greatly improve long-term planning, but would also lengthen tenures for idiots like Bush. To Herbert: I do not agree! How have such countries as France fund the huge development high speed train (for each line cost billions of euros? and are really long term). France open the 10 June a new high speed train line. To Herbert: I do not agree. These “short term government” have managed to develop huge train, metro, motorway systems in western countries a very long time before “long term view” Chinese government build the first metro or highway. They also put hundred of billions of Euros in public research and space exploration. You’re quite right. I was referring to the Anglo-Saxon governments rather than the continental style. Yep, it is definitely a trade-off. After five millenia of civilisation I don’t think anybody has found the perfect form of government just yet. So it is quite presumptuous to use the superiority of one form of government over another as a justification for war. Meantime, your map above shows that Metro Line 2 will also be extended to Pudong Int’l Airport. Do you think it will actually be built since the Maglev is already running from PVG to Longyang Station. If Line # overlaps Meglev’s route at much cheaper fares, probably very few people will ride Meglev. I believe if indeed Metro Line#2 will connect PVG with Hongqiao Airport, it will not only be greatly welcome by the public, it will substantially improves the traffic jams around these two airports. Does anyone know when the first phase of line 8 will be open? i’m doing a masters of architecture in london and the project site in in shanghai. really useful info on the tube and maglev, thanks a lot. could you tell us the book reference where you got it? 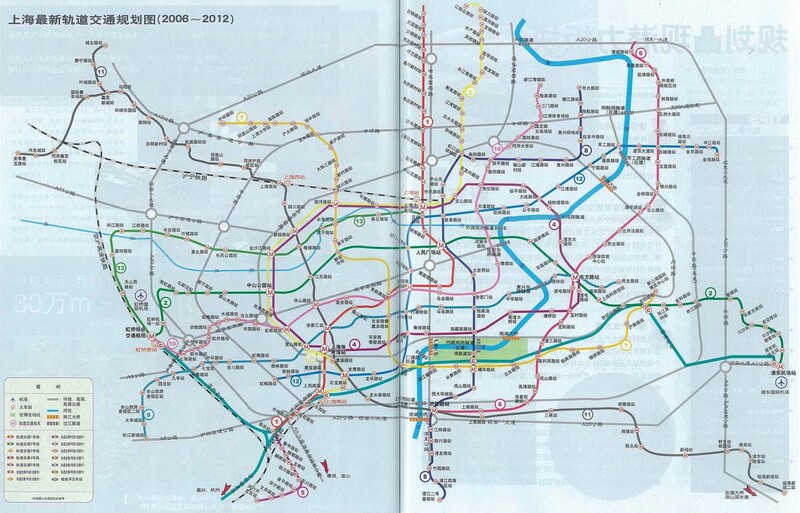 Shanghai Yellow Pages 2007-8 English version has very good metro maps showing stations for lines 6,7,8,9 & 10. I am happy about that Shanghai authorities keep their promises! Three new lines at the end of 2007 is something fantastic. Can anyone please tell me how the shanghai metro has been funded? My plane will land on 1515 at Pudong on december 13. I have to take the train at 1818 from shanghai train station . Please tell me is it possible to catch train ? if yes then how can i do that ? @asif Actually you’re fortunate enough to catch your train. You can take the Maglev from Pudong Airport to Longyang Station, which only takes about eight minutes. At this station you can change to take metro to go to the shanghai raily way station. You need to take Metro Line 2 line first, and change to Metro Line 1 at the People’s Sqare Station.the whole Metro trip will take about half an hour. Haha, just take it easy.